Choosing the right vinyl siding color or texture can be a challenge. Made of PVC, vinyl siding is durable and available in a range of colors, which vary by manufacturer. These colors are also among the most popular colors for houses in general; using them will help ensure your home fits in well with your neighborhood and is attractive to future prospective buyers. Before you select a color of vinyl siding for your home, make sure you consider several factors that may impact your decision. If you live in a historic home, try to use appropriate colors that honor the history of the home. A bungalow, for example, needs an Arts and Crafts or Craftsman palette that reflects natural colors and tones to look its best, while a Victorian requires "somber" or muted tones. Light colored vinyl siding is a good choice if you live in a warm climate, because lighter colors reflect sunlight and help keep your home cool. If you live in a cold climate, darker siding could be a better choice. While vinyl siding is easy to clean and maintain, keep in mind that it can still get dirty and does require you to wash it off to keep your home looking its best. Mid-tones such as grays and beiges don't show dirt nearly as much as extreme dark and light colors. Curb appeal, the way your home looks to viewers, extends not just to your home, but to your entire neighborhood. If your home is out of place, color wise, from the rest of the home's surrounding it, this can detract from its curb appeal and from its resale value. You should also check with your neighborhood association, if applicable, before choosing a siding color to make sure the color you choose is acceptable and doesn't exceed any color restrictions. Houses rarely come in one solid color. 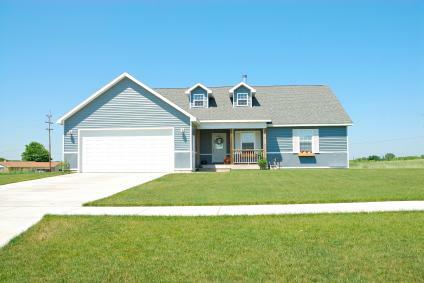 Often, homes comes in two, three or even four colors when trim, shutters and other details are taken into consideration. Just like choosing a paint color palette for your home's exterior, you need to select a vinyl siding palette as well. This means making sure that the main color you select coordinates well with secondary colors and that the company you choose a color from has coordinating trim pieces in the colors you need. The way a piece of vinyl looks in the store may not be the way it looks in the sunlight and shadows that surround your home. Before you finalize any decision, take home a few pieces of siding as a sample and look at them from all angles around your home. Be sure to look at the colors in all lights and all times of day and in the evening to ensure the color you are choosing is the right one. Samples are available from most manufacturers and siding showrooms; if a sample is not available, try purchasing a few pieces instead. This is a small upfront cost that could help prevent you from making a bigger, and costlier, mistake. If you need assistance in visualizing what your home will look like in its new color, there are interactive programs online that can help you do just that. Norandex has an online imaging tool that allows you to upload a photo of your own home to see how it will look in different colors of vinyl. CertainTeed's Colorview program lets you change the colors on stock images to see how a color effects the look of a home. Patton Contracting has an interactive tool on their website that shows 13 different colors of vinyl siding on one home, to help you visualize the total effect. Choosing the color of vinyl siding for your home may feel more permanent than paint, because it won't need to be changed, updated or replaced every few years. Take your time considering your options and how they will affect the look of your home to make the right decision for you.